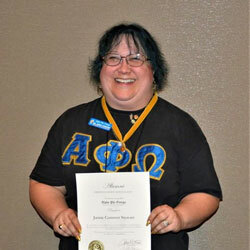 The room in Austin, Texas, was packed andbuzzing with energy during the Alpha Phi Omega’s (APO) 45th Biennial National Convention. As the award ceremony — during a conference that’d stretched from December 27-30 — wound on, Regent University alumna Jamie Stewart (SBL ’10, SOE ’17) sat at her table, relishing all of it. A veteran member of the fraternity for over 30 years, she’d already received eight awards for her service to the organization. On December 29, during the alumni luncheon, APO’s National Alumni Relations Chair announced that it was time for the fraternity to bestow the National Alumni Distinguished Service Key (NADSK) on a member. The recipient was Jamie Stewart. The journey hasn’t been easy; for Stewart, it made receiving the award all the more significant. In 2010, she earned a master’s degree in organizational leadership from Regent’s School of Business and Leadership. Then she decided to pursue an Ed.D in education at Regent. But after taking on the academic rigor of pursuing a doctorate’s, she had an even bigger hurdle to overcome. “It was like a punch in the solar plexus,” said Stewart. That’s how she articulated what it felt like when her doctor called and diagnosed her with cancer in 2012. Since the diagnosis, she’s continued working, and recalls working on her doctoral competency exam not from a library or coffee shop, but from a chemo chair — a testimony to her resiliency and determination. In 2017, she graduated with her Ed.D. “[I’ve had] absolute support from the dean, from my chair … encouraging me,” she said. And as for the APO National Alumni Distinguished Service Key, Stewart acknowledges it’s a rarity — one that only one, maybe two, people receive each national convention. Stewart joined APO in 1987 during her undergraduate years at Virginia Tech. She now serves as a community advisor at Norfolk State University, Old Dominion University, Regent University, and as Region L and Region M Extension Coordinator. The latter position allows her to help charter and re-charter chapters in North Carolina, South Carolina, Virginia, and West Virginia. The core principles of the organization are leadership, friendship, and service. Last fall, members from Regent’s APO chapter packed care packages for the homeless at Stewart’s church in Portsmouth.